These acquisitions posts are slowing down recently since my anime purchasing has gone on hold for a couple of months (aside from an odd preorder slipping through here and there). I got some good stuff today. 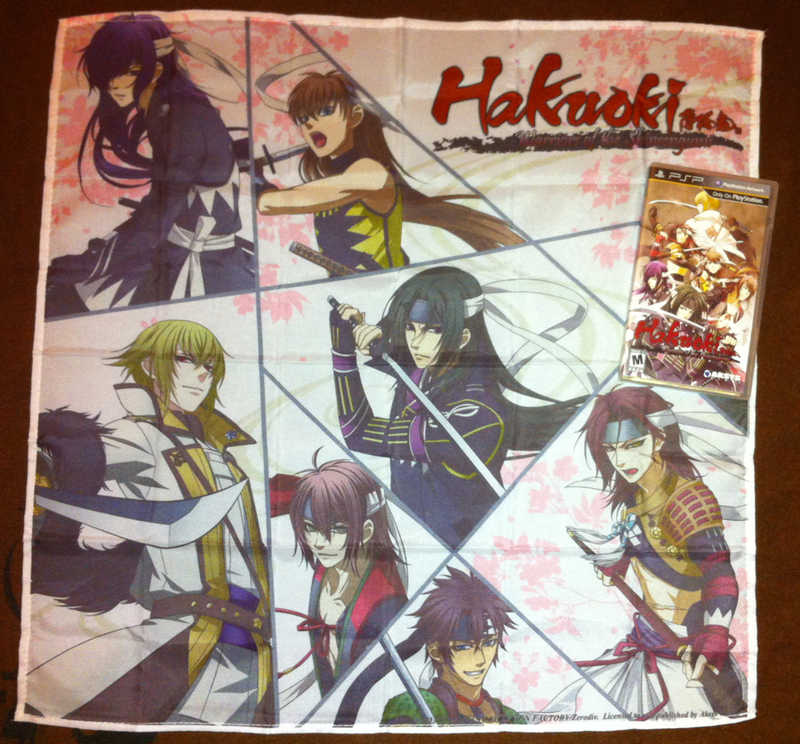 First of all, my preorder for the US version of Hakuoki: Warriors Of The Shinsengumi (Hakuouki Musouroku) arrived. Because I'd purchased it from Amazon, it came with a bandana as a bonus. Aksys are probably my favourite US game company these days with their recent forays into otome titles. I put the game box on top of Sannan's face for the picture because I don't like him much. While checking the link for Hakuouki, I noticed that Sweet Fuse: At Your Side (Bakudan Handan) - the next of Aksys' otome games - is already up for preorder on Amazon, so I've added it to my list as well. It looks as though it's going to include some kind of bonus item too. Keep them coming, Aksys! 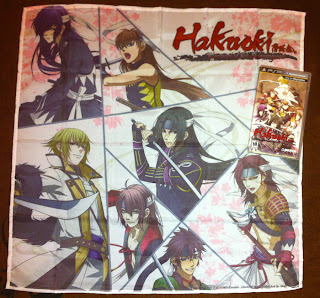 Hakuouki wasn't the only game-related item to come recently. Dynasty Warriors 7: Empires (Shin Sangoku Musou 6: Empires) also made an appearance along with its GAME-exlusive preorder DLC. 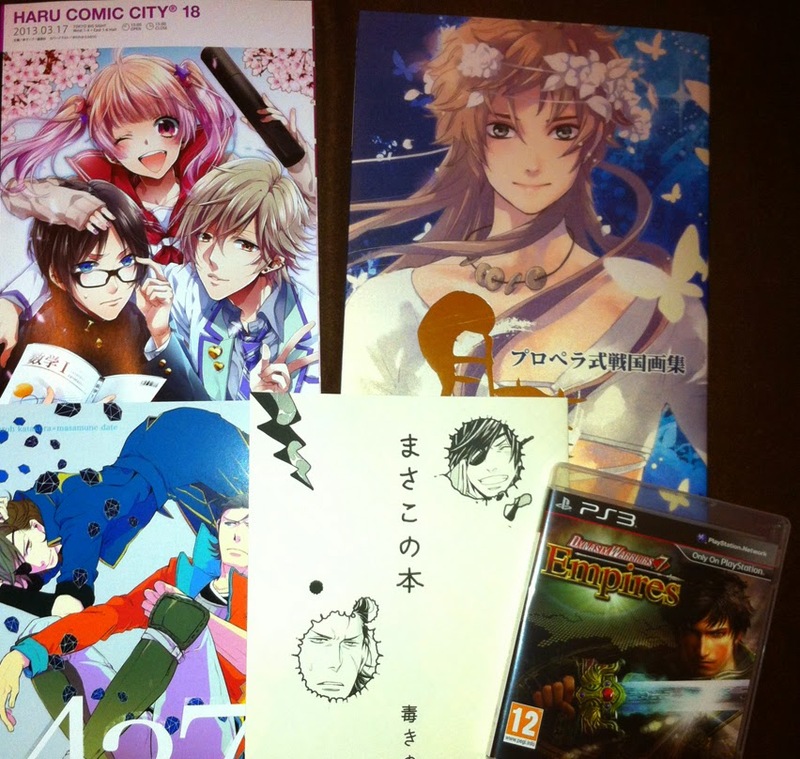 Accompanying it are two Sengoku Basara doujinshi, one stunning Someya Rui art book loaded with full colour illustrations and the Haru Comic City 18 event catalogue. It was unintentional, but I just noticed that I covered up Hisahide's face with the game in this picture. Perhaps I can make a habit of this if I buy enough games.